What to do next? I really enjoyed operating Charlie Duckworth’s Bagnell Branch, so an out and back branch was a priority. Which railroad, which branch? I had formulated an idea nicknamed “The All Star Route,” the logic was being able to use real track and structure arrangements, but substitute my favorite buildings for the actual ones. It was a kind of a prototype scramble if you will. That logic fell apart when I had to actually put real names to my scrambled places. Once a prototype modeler always a….well, you know. So it was back to go, but collect no money, just experience. Experience had taught me to make my next layout more movable. 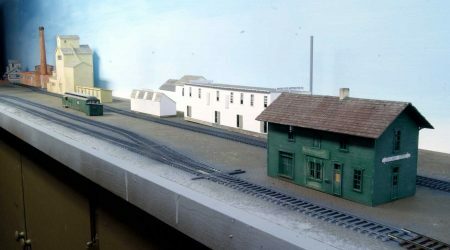 The next layout would be a series of small rural towns, dioramas that could slide in and out of the benchwork if I wanted to replace them. 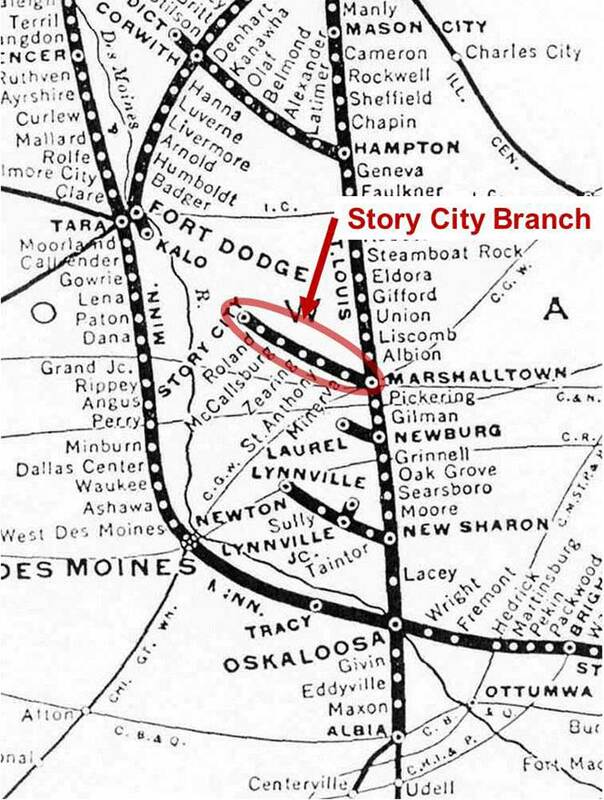 The town I based my whole out and back concept around was Roland, Iowa, on the Minneapolis & St Louis’ Story City Branch so why not model the Story City line? This blueprint is from M&StL AFEs courtesy of Gene Green/CNWHS. This blueprint shows all the M&StL trackage that was in Story City. I picked and chose which I thought would be best for my model operations. The turntable was removed in the early 40s, so I deleted that, too. The short spur with the engine house was removed in the late 20s and a ramp was built about where the turnout is. I kept the track and combined the ramp and lumber yard as spots on it. At one time there was a track in front of Jensen’s concrete. I moved the spur track with the stock pens to serve Jensen’s. The stock pens were pulled in the late 30s. From Vincent Mart collection Iowa State library, Iowa City Iowa. 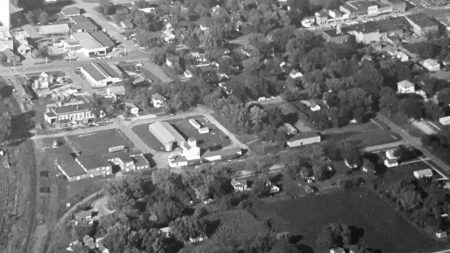 This photo dates from the mid- to late-60s and shows the connection with the CNW (running vertically on the left side of photo) that was added to serve the elevator where the M&StL pulled out of town in January 1953. The cannery windows are boarded over. The building right of the elevator is Story City Butter Tub. The depot would have sat to the right of it. My plan is to start at the end of the line, Story City, and work backward to staging. By building the end of the line town first and making staging movable, I can finish an area before moving on. I would keep moving staging ahead of my work, thus keeping the line operational as I worked on completing the next diorama. So far my plan seems to work. Story City is a long, linear town. The blue print and aerial images here illustrate the M&StL right-of-way in town. I built two movable bases eight feet long and 16-inches wide for Story City. The west end of Story City, or the end of the line, is in the early steps towards completion. Buildings are in place and track is painted, but not detailed yet. I built all the structures before laying the track. 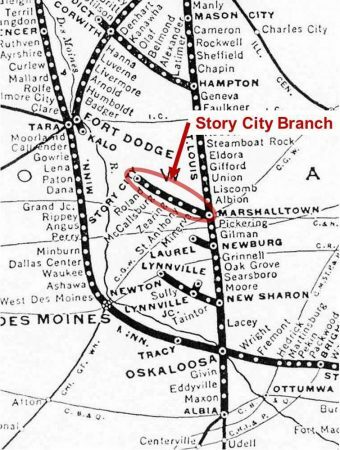 The M&StL pulled out of Story City at the end of 1952. I decided to model the fall of that year. The depot has been abandoned making Roland, Iowa, the next town east and the new end of the line joint agency for the remaining months. The white buildings are the Story City Butter Tub Co. 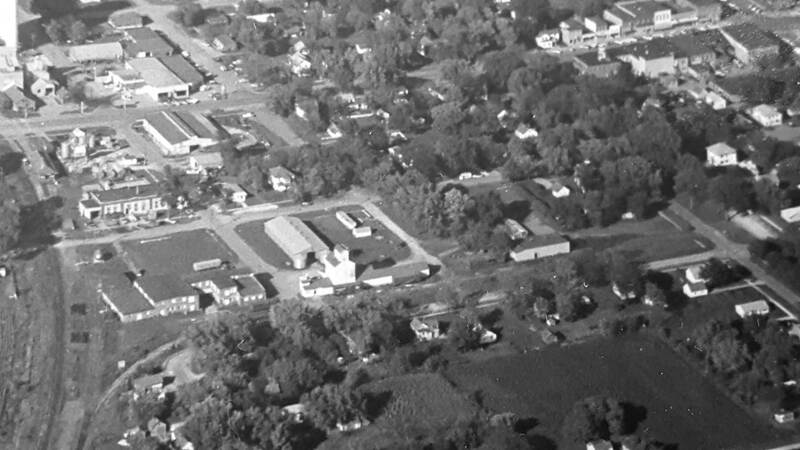 The larger building being the factory and the two smaller structures hold coal and roofing materials which they also sold. The grounded passenger car and small shed were salvaged from my previous layout and will now serve the section gang and carman. The grain elevator and brick canning company along with the butter tub factory were built using partial photos. 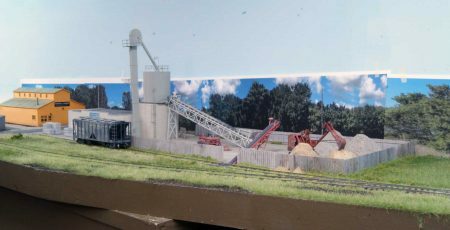 The other layout section is the east end and features Randall Lumber and Jensen Concrete. I prefer to work seated so the layout sections can sit on a lower table as various parts are added. 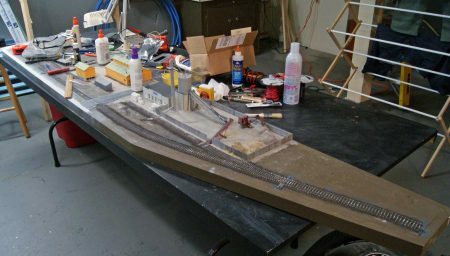 Structures are built, track is in place and scenery has been started in the image above. I work quickly, so the scene did not look this way for long. The east end of Story City is nearing completion. Detailing is an ongoing thing. The backdrop photos are temporarily taped in place. We’re looking at Jensen’s Concrete Products, makers of concrete blocks and yard ornaments. I have a poor photo of the block single story building only. I added the fenced in yard and mixing tower to add variety to rail service. Now we can bring in aggregate and cement besides outbound loads of block. To the west, across the street from Jensen’s is Randall Lumber. As you can see this area is ready for static grass application. I have no information on the real Randall lumber other than that on drawings. I built a generic lumber yard by studying aerial photos of Upper Midwestern towns. I haven’t built the staging yard yet, but have enough headroom east of Story City to place a train bound for the town. I like what I’m doing. You can’t ask for more than that. We thank Clark for sharing his new M&StL layout adventure. 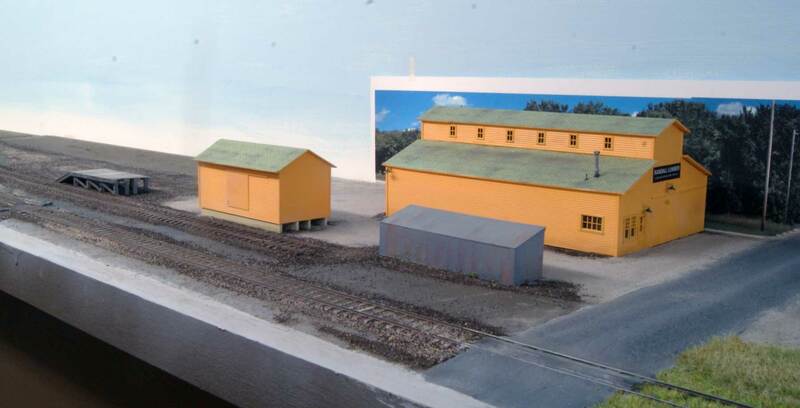 Many prototype locations can offer inspiration for an operating model railroad to fit your space and needs. Clark will feature his layout design ideas and progress at the RPM Chicagoland meet October 20-22 in Lisle, IL. Clark I to have decided to try a similar branch line concept. As I am a multiple prototype modeler(CB&Q, GM&O, ITC) I can not decide between a freelanced branch line for all 3 roads to use separately, or to just model the GM&O’s Dwight, IL Branch. It had one tri-weekly local that was based out of Dwight and ran to Washington, IL Mon, Wed, Fri and returned On Tue, Thur, Sat. The Q had several branch lines in the same general area so the Dwight Branch could also serve for a Q Branch with a change in depot’s and service buildings at each location. The ITC had no real branch lines so it is not an option. What are your views on such an idea. Clark I like what you are doing so far but I lam sorry to see your old layout go. This is great. I especially like the old station sinking into decrepitude (kinda like me that way), and the grounded old RPO/baggage. Please keep us apprised of your progress, and, if you can, supply us with a trackplan. I just might want to tackle this myself…. John, There’s a track plan of Story City included. Click on it to enlarge. I have the station maps for the other two towns I plan to model. The three “LDEs” will be strung together in a serpentine arrangement to fit the space.